The Miniature Schnauzer is a robust, sturdily built, energetic and affectionate dog breed. 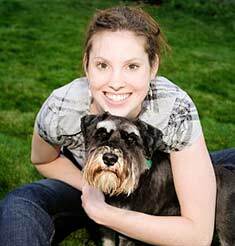 Quick and tough, Miniature Schnauzers can also be very pushy and aggressive to other dogs. To prevent such characteristics from forming, consistent training and early socialization is suggested. Its longer hair on muzzle and eyebrows augment its strikingly keen facial expression. The Miniature Schnauzer originated in Germany. Miniature Schnauzers range from 12 to 14 inches. Miniature Schnauzers range from 13 to 15 pounds. Miniature Schnauzers are either salt and pepper or black. 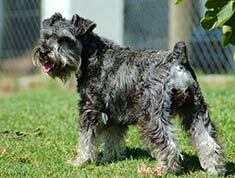 Miniature Schnauzers have hard and wiry outer coats. Daily brushing is required to keep the coat from matting. The Miniature Schnauzer is an inquisitive, playful and affectionate breed. They are less dog-aggressive than most other Terriers. Easy to train, this dog breed makes a good companion and family pet. Sometimes clever, sometimes stubborn. The Miniature Schnauzer is generally good with children. It can be a barker. 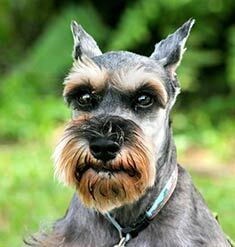 The Miniature Schnauzer is susceptible to liver disease, kidney stones, skin disorders, cysts and eye problems. The expected life span of the Miniature Schnauzer is 12-14 years. 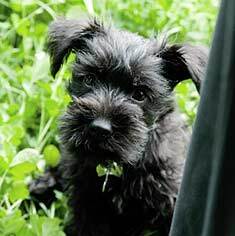 Miniature Schnauzers are suitable for both city and country living. Miniature Schnauzers do better in a house than in an apartment because this breed can be noisy. The Miniature Schnauzer is in the Terrier Group. Although the Miniature Schnauzer wasn’t originally intended as a companion dog, this terrier-like breed turned out to be perfect for just about anyone looking for a little buddy. Not only is the size of this dog just right for a lap, the easy-going Mini can adapt to many different situations — from a rural setting to an urban apartment. It also has a distinct advantage as one of the few dogs that does not shed. Currently, it’s the 11th most popular breed in the United States. 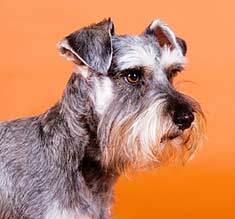 Square and sturdy, the Miniature Schnauzer sports a bushy beard and eyebrows like its larger cousins, the standard and giant schnauzers. The Mini was first recognized as a separate breed in Germany in the late 1800s and has been in the United States since 1925. Typically between 11 and 20 pounds and from 12 to 14 inches tall at the withers, Minis can be found in several color schemes: black, white, black and silver, and salt-and-pepper. In past decades, the Mini’s ears were cropped to a point and its tail docked; these days, this is still the case for show dogs. However, you’ll often see family Minis left “natural,” with floppy ears and longer tail. Originally bred as stable watchdogs and ratters, the intelligence and personality of Minis soon earned them a place inside the home. The word schnauzer is German for nose or snout, an appropriate name, since they have excellent noses for sniffing out vermin. Some airports now use Miniature Schnauzers as drug-sniffing dogs. Although Minis are small, they’re not so tiny that they might get squashed. They are just the right size to easily travel in a car. Although energetic, Minis are not as hyper as some similar-sized breeds, and their need for daily exercise can be satisfied with a brisk walk and some indoor play. 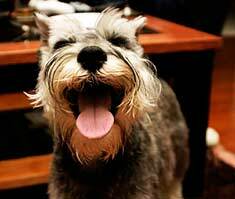 Miniature Schnauzers often have endearing, very individual personalities. Intelligent and loving, they are easy to train, but also require regular attention and exercise to be happy. If socialized with people and other dogs, they’ll get along in all kinds of situations, and are generally good with children. They make great watchdogs, and will often hear a visitor’s approach long before the owner does. Sometimes excessive barking at visitors is a problem, but one that can be corrected with time and consistent discipline. Minis will happily catch rats and mice if given the chance. A strong digging instinct may have to be curbed, however, if that is a problem for owners. Minis can do well in obedience and agility competitions, if properly trained; they are also eligible for Earthdog competitions and can excel at them. Although Miniature Schnauzers don’t shed, regular trimming is needed to keep them looking their best, since the coat can easily get matted and tangled without daily brushing. They are shorn short on the body, and the leg hair, or “furnishings,” is left long. The face is clipped to emphasize the beard and eyebrows. Minis live to be about 15 years old, and as a breed, have few health problems. They like to eat, and often gain weight easily, which may be a concern for less active dogs. Minis can also develop diabetes, pancreatitis or bladder stones. When purchasing a Miniature Schnauzer, buyers should ask about temperament as well as any potential health concerns. In the case of puppies, it’s helpful to meet the parents to see what their personalities are like. Spirited yet gentle, playful and smart — your Miniature Schnauzer can be a devoted companion for many years to come. Find Miniature Schnauzer Puppies with our Free Breeder search!